3D Interactive Presentation without the Pain and Expense! You are here: Home / Aurora 3D Presentation / 3D Interactive Presentation without the pain or expense! 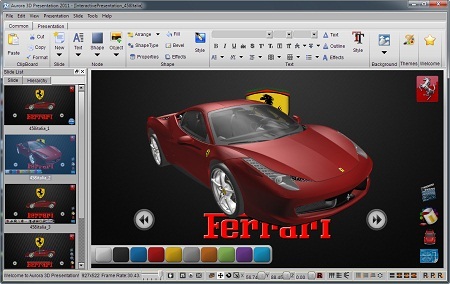 3D Interactive Presentation without the pain or expense! Quickly and easily create great looking, 3D interactive presentations without the need for 3D design skills, and without paying thousands of dollars to third party designers. Import your own, or 3rd party images, videos, textures and even 3D models. Build your own themes, or take advantages of the many included design elements, include backgrounds, themes, styles, shapes, effects etc. Export the final presentation to a standalone Windows executable or to a video file. If a picture is worth a thousand words, then an interactive 3D presentation speaks volumes! Wow them with eye-popping 3D graphics, charts, images and models – but instead of the high cost and learning curve of 3D software you can generate these presentations with one simple package, and in a fraction of the time. Aurora 3D Presentation gives you access to powerful techniques that you can harness to develop impressive, professional, and effective presentations, and then deliver them in a wide range of formats. With Aurora 3D Presentation, you’ll be able to produce solutions that incorporate images, text, video, and data in a way that will capture the attention of your audience. Even if you don’t know where to start, Aurora 3D Presentation will keep you inspired thanks to the library of templates and styles. So, what can you do with Aurora 3D Presentation? How about an interactive menu that automatically launches slideshows, websites, or executable programs? Or a wall of pictures and information, arrayed in a circle or a gracefully curving animated arc around the viewer? Spice up those boring spreadsheets by importing CSV files into Aurora 3D Presentation and animating tables and data, or create animated charts and graphs, even 3D models! Everything that you could ever ask for in a presentation product is here with Aurora 3D Presentation! Import images, create albums, use 2D and 3D text for impact, and play around with special particle effects and backgrounds! When you’ve completed your masterpiece, export it as a stand-alone executable, interactive Windows application, or as a video file for multi-platform, or for the web.